Recent Palestinian politics are the subject of inordinate journalistic and scholarly attention; the University of Pennsylvania library, for example, contains no fewer than twenty-two books on the intifada. A groaning shelf scrutinizes every twist in the rise and fortunes of the Palestine Liberation Organization. This intense interest makes it all the more surprising that Baruch Kimmerling and Joel S. Migdal's Palestinians: The Making of a People presents a first overview of Palestinian history. As such, their book offers original and highly useful insights. By integrating scattered and little-known materials, they do more than gather information in one place; a dramatically new perspective emerges. Even readers familiar with the record of this would-be nation can now see the Palestinian experience as a whole. Perhaps most importantly, Kimmerling and Migdal reveal a number of continuities going back decades and, in some cases, even centuries. In their view, three revolts against outside forces - against the Egyptians in 1834, the British in 1936-39, and the Israelis since 1987 - constitute the paramount events of Palestinian history. Each revolt undermined the existing leadership while enhancing the consciousness of a common fate. The latter two uprisings shared another feature: what began as an act of political assertion against the occupier ended as gangsterism against fellow Palestinians. A second abiding feature of Palestinian politics concerns the inability to achieve more than a negative unity (against the British, the Israelis), never a positive one, an inability which has repeatedly weakened Palestinian endeavors. In large part, disunity follows from a fragmented geography, for Arab Palestine contains three political subunits whose residents have contested power during the past hundred and fifty years. The coastal plain, with Jaffa its main city, predominated during the six decades before World War I. Jerusalem, the administrative and religious center, dominated during the first years of the British mandate. And the hills to the east, centered around Nablus, reigned during the 1948-67 period and again during the intifada. None of the regions have the strength permanently to dominate the other two, and so the rivalry continues on. Since 1937, the Palestinian leadership has been split in another way: between local figures and those in exile. From their places of banishment in Nazi Germany, Nasser's Egypt, or strife-torn Lebanon such chiefs as Mufti Amin al-Husseini, Ahmad ash-Shuqayri, and Yasir Arafat have sought to dominate a population they could not physically control. Palestinians on the ground have sometimes accepted the supremacy of these distant authorities, sometimes not. The rise of Faysal al-Husayni and Hanan Ashrawi in recent years points to a persistent desire by locals to assert their own views. Continuities take minor forms, too. For example, Kimmerling and Migdal have collected the vanity postage stamps issued by three Palestinian organizations (the Arab Higher Committee, the All-Palestine Government, and al-Fatah). All of the stamps assert the existence of an Arab polity named Palestine; none can be used to mail a letter. These stamps, as well as a "Proclamation of Independence" and a whole panoply of PLO "embassies" and "passports," suggest a persistent illusion that pantomiming the activities of a real state will somehow also bestow its powers. A final continuity, but one to which the authors devote scant attention, concerns the Palestinians' extremely fluid sense of identity. Exactly who are the Arabic-speaking people who live between the Jordan and the Mediterranean? Syrians, they would have replied in the decades before 1920, when "Syria" included virtually the whole of the Levant. Palestinians, they would have said in 1920 and for the next three decades. Arabs, would have come the reply between 1950 and 1967, as Pan-Arab nationalism soared during the heady days of Gamal Abdel Nasser and crashed with him in the Six Day War. Palestinians, the answer would again have come after 1967. Today, however, the Palestinian identity appears to be in a fairly advanced state of decay. The PLO suffers from financial difficulties, political drift, and incapacity among its leadership (neither Arafat's head injuries in an airplane crash last year nor his marriage have helped). As the Palestinian separatist identity weakens, the Muslim identity surges. Should present trends continue, Hamas could replace the PLO as the leading Palestinian organization in a few years. The weak definition of Palestinian identity manifests itself in other ways too. Take the matter of political terminology. In the 1910s, Zionists lobbied London to use the name "Palestine," seeing it as a name which corresponded to the Land of Israel of Jewish tradition. In contrast, through twelve centuries of Muslim rule, the territory had never formed a separate political or administrative unit; and in 1918 Muslims did not want one to appear. Later, as Jews discarded "Palestine" in favor of "Israel," Arabs embraced the former term with fervor. Today, Filastin not only resonates deeply among Arabs, but conjures up near-mystical allusions. ("West Bank" underwent a similar metamorphosis, as Kimmerling and Migdal point out; what began as a Jordanian substitute for "Palestine" in the 1950s now serves as a shield to fend off the Likud term "Judea and Samaria.") Such shifts in terminology confirm the wholly unsettled quality of Palestinian politics. 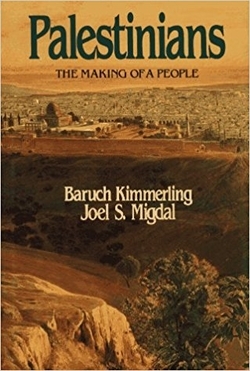 Their synoptic perspective enables Kimmerling and Migdal to interpret Palestinian history in new ways. For example, they see Palestinian politics during the Mandatory period as far more sophisticated than do other historians. One such historian, Benny Morris, referring to the late 1940s, holds that "the Palestinian Arabs were backward, disunited, and often apathetic, a community only just entering the modern age politically and administratively." Another, Ilan Pappé, dismisses the Palestinian leadership as "an élite in confusion" and argues that it failed to use the Mandatory period to prepare for the war that came in 1948. Kimmerling and Migdal disagree; they reject as "misleading" the thesis of Palestinian political immaturity in the 1930s, and they make a good case for their revisionist view. What happened, they say, is that the complex institutions developed in the '30s were destroyed by the Arab Revolt of 1936-39, and then could not be reconstructed. "In the circumstances of World War II and the new constraints imposed by the Arab states, [the Palestinians] never managed to recapture these political foundations, nor adapt politically to the vast social changes overtaking their community." And so came the defeat of 1948. Few subjects arouse such passions as the Palestinians, and Palestinians promulgates its own share of controversial assumptions and dubious positions. Most fundamentally, it simply asserts that Palestinians constitute a people, without proving the point. A self-proclaimed national group which came into existence in 1920, which subsequently disappeared for nearly two decades, and which has never enjoyed sovereign power may endure; but it may also disappear along with prior allegiances. (We don't hear much about Southern Syrians living in Nablus and Ramallah any more.) The authors' silence on this key subject suggests that they think the matter more settled than it may be. Put differently, it is just possible that Palestinians: The Making of a People will in the future sound as outdated as Yugoslavs: The Making of a People would today. Other questionable assertions include the suggestion that the development of separate Palestinian and Zionist economies in the early twentieth century contributed to their separate nationalist movements; in fact, the reverse is closer to the truth. Dismayingly, Kimmerling and Migdal repeat the simple-minded falsehood about an "ancient conflict" between Arabs and Jews. (The notion of an Arab people goes back only to the 1890s.) The authors claim the Balfour Declaration "resuscitated" Zionism; instead, it strengthened an already existing Zionist movement by lending it the support, however fleeting, of a great power. Another problem arises from the authors' determination to achieve political neutrality between Palestinian and Israelis. While laudable when exercised in moderation, when relentlessly pursued this approach can lead to unhappy results. To avoid blaming either party for the many brutalities between them, Kimmerling and Migdal point the finger at circumstance. Thus, explaining the Palestinian flight of 1948-49, the most contentious issue of the entire Arab-Israeli conflict, they blame "the risks and insecurities of a brutal, increasingly unavoidable war." This mild form of moral equivalence works no better here than in the Cold War; authors owe it to their readers to judge and to assign responsibility. But these problems and certain errors of fact aside, Palestinians has much to teach. Approached with caution, it adds life to what has long been a two-dimensional construct.